In 2017, Newtec has continued to innovate and develop new technologies and partnerships, cementing its position in the satellite industry doubling its size and impact since introducing Newtec Dialog® in 2014. Disruptions in satellite technology and market changes in media, government, cellular and mobility markets — along with the growing prominence of High Throughput Satellite (HTS) platforms and the advent of Low Earth Orbit (LEO) constellations — present a complex set of challenges but also a lot of opportunities. However, amid the changes there is consistency in the ever-increasing data requirements of the end-user, which acts as an important driver for Newtec. Against this backdrop, the Newtec Dialog® multiservice platform is becoming ever-increasingly relevant, providing service providers and operators with flexibility across different markets to serve a wide range of customers and applications, including broadcast, government and defense, consumer and enterprise VSAT, and especially in mobile backhaul and mobility, including Inflight Connectivity (IFC) and maritime communications. There is no question that HTS technology is transforming the satellite industry. This evolution in the payload is driving the market to look for new opportunities to exploit the increased performance it can offer. However, for HTS to succeed, this innovation in space must be matched on the ground. This key dependency drives Newtec to ensure that terminal and hub technologies are ready to maximize the benefits of HTS, and are never the weakest link in the value chain. As such, Newtec unveiled a number of new HTS-optimized DVB-S2X wideband products this year, as part of its Newtec Dialog® multiservice platform. Designed to support the massive scalability required by HTS networks, Newtec launched the Newtec Dialog XIF Hubs at SATELLITE 2017. This new hub architecture provides higher throughput and density in a robust, carrier grade package. At the same time, Newtec completed its DVB-S2X wideband modem portfolio with the launch of the MDM2210 and the MDM3310, which joined the existing MDM5000 modem. Built to address the needs of various vertical markets, the full family of modems allows customers to benefit from the unprecedented efficiencies and throughputs enabled by HTS, regardless of their application or price point. The broadcast market is another example of an ever-shifting landscape. The way in which people consume content is changing and the demand for 4K/Ultra-High Definition (UHD) programming is increasing. In order to keep up with these trends, broadcasters need to find new ways of making the most of their existing space segment. This can be achieved by deploying Newtec’s high-performance satellite broadcast solutions, allowing broadcasters to deliver more content at lower costs, without compromising quality or reliability. Throughout 2017, Newtec’s ground segment equipment has been deployed by broadcasters and news agencies around the globe as they increasingly focus on streamlining their operations by leveraging the power of all-IP services. Ahead of IBC in September, Newtec announced that BBC News had deployed the Newtec Dialog multiservice platform to reap the benefits of IP connectivity over satellite. Bonding terrestrial and satellite IP media allows news teams to deploy mobile solutions capable of transmitting video, voice, files and general broadband services though a single multiservice communication link, which is available regardless of geolocation, actual 3G/4G access or weather conditions. Newtec Dialog played a key role in September’s Bridgestone World Solar Challenge, providing the IP connectivity the Belgian Punch Powertrain Solar Team required to livestream interviews, enriched with professional-grade race images, as well as backhaul video clips during the >3,000km race from Darwin to Adelaide. Collaborating with Network Innovations, VRT Sandbox and Pacific Life Media, Newtec’s technologies enabled the race crew to broadcast daily overviews of their journey even when camping in the middle of the Australian Outback, where Satcom was the only way to stay connected. The ease of use of the provided solution avoided the need to deploy traditional satellite trucks operated by skilled staff. 50 percent additional capacity for HD exchanges. Bandwidth efficiency is another key cost driver for Newtec’s broadcast customers, with DVB-S2X providing a solution that enables significant OpEx savings. Televisa in Mexico was among the broadcasters which made the upgrade to DVB-S2X in 2017, with the Newtec MCX7000 Multi-Carrier Satellite Gateway, which comes with DVB-S2X on board. The efficiencies delivered by DVB-S2X technologies formed a key part of Televisa’s decision to opt for the MCX7000 for part of its nationwide end-to-end primary distribution system. Deployed in May, the satellite gateways enable Televisa to offer six HD channels and improved picture quality using a 36 MHz transponder. M7 Group selected the MCX7000 for their new European Direct-to-Home (DTH) transmission sites, saving power and rack space. Advanced technologies such as low roll offs and Equalink®3 pre-distortion allow more channels to be transmitted with the best possible quality, without increasing the number of transponders. Viewers receiving content via Media Broadcast Satellite GmbH’s uplink in Usingen, Germany, will benefit from this new platform, which was installed earlier this year. As mentioned, using DVB-S2X gives the satellite industry the opportunity to increase profitability by delivering improved efficiencies without investing in additional costly space segment. DVB-S2X’s Channel Bonding is one such optimization, allowing a single DTH stream to be transported over up to three transponders and treating them as one logical transponder. Newtec’s IBC demo in September featured Channel Bonding according to the DVB-S2X standard. This showcased Newtec’s compatibility with the Broadcom DVB-S2X Channel Bonding chipset, which is supported by leading players from the industry (Eutelsat, Harmonic, Hispasat, Insight TV, Intelsat, MEASAT, SES and Yahlive). Increasing pressure is also being felt by mobile operators. As markets mature and governments begin to enforce Universal Service Obligations (USO) to bridge the digital divide, they are facing increased demand to extend their services in rural areas. In those regions, where terrestrial infrastructure is limited or non-existent, cellular backhaul over satellite is allowing people to remain connected and keep pace with the fast-developing technology landscape, providing the reliable connectivity and quick roll-out that mobile operators crave. This requirement saw the Newtec Dialog multi-service platform deployed by several major and incumbent operators in 2017 for the provision of cellular backhaul services in rural areas. Teledata — Mozambique’s publicly-owned telecommunications specialist — opted for the multi-service platform with a HUB 4IF Hub Module at its core to power its network for hundreds of mobile backhaul sites across the nation. Teledata also made use of Newtec Dialog’s multiservice capabilities, using the MDM2500 IP Satellite Modems, centrally managed by the same hub, to connect hundreds of ATMs at remote sites and provide reliable back-up connectivity to regional bank branches. Earlier in the year, Newtec Dialog was also deployed to provide cellular backhaul for Mattel, Mauritania’s leading mobile operator. Working with its certified business partner GLOBAL Technologies, Newtec installed a Newtec Dialog Hub and deployed several remote sites across the Mauritanian nation in record time. The network is built to initially deliver 2G mobile connectivity, but is gearing up for 3G and 4G services in the future. Mattel is also leveraging Newtec’s unique, dynamic Mx-DMA® bandwidth allocation technology on board the Newtec Dialog platform, enabling services to be delivered with the efficiency of SCPC and the flexibility of MF-TDMA, reducing operational costs while increasing reliability. Beyond this, Newtec is actively working to expand its solutions for upcoming 5G networks. The company is working closely in this area with other industry partners such as the European Space Agency (ESA), including defining solutions and investigating opportunities for satellite to support 5G across expanded vertical industries. The need for data to be delivered everywhere will see Communications-On-The-Move (COTM) become an increasingly key market. Newtec is already making great strides here, with the first commercial flights featuring Panasonic Avionics’ Newtec-designed modem for IFC taking place in 2017. In a nutshell, Newtec’s focus for 2018 is to continue to provide the answers to difficult questions in the satellite industry, enabling the businesses of today to prepare for the developments of the future and delivering what people need before they know they want it. 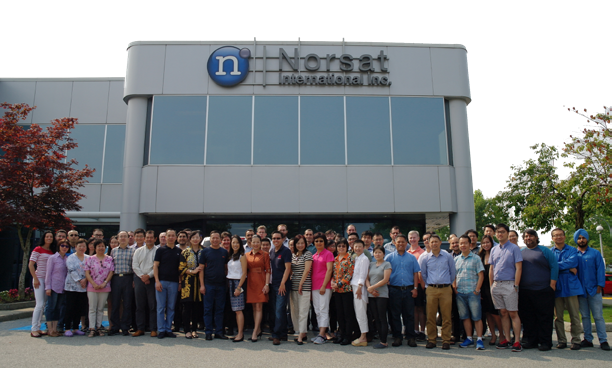 Norsat experienced a terrific year in 2017, especially as the company celebrates 40 years in the satellite communications industry — the company continues to be a leading, global provider of portable satellite terminals and satellite components. From humble beginnings to a successful international business, Norsat has experienced many ups and downs to become a leading company in the SATCOM industry. Norsat International began operations in 1977 as Northern Satellite Systems with a mission to develop satellite technologies for the consumer and commercial markets. The founder of Northern Satellite Systems and first President was Rod Wheeler. He started the company with an innovative idea, to build the first affordable consumer satellite dish. From his cabin in Whitehorse, Yukon, Rod toiled over the construction of a workable satellite dish. Even with the limited materials he had available, Rod successfully constructed a satellite dish from chicken wire and foil. This dish was the first prototype for Norsat and the unit helped to launch the company into the SATCOM market. Now, 40 years later, Norsat has established a solid history of developing innovative, high quality products and has brought many industry firsts to market. Norsat’s product line product line has grown to include portable satellite terminals, maritime solutions and satellite components, such as low noise block downconverters (LNBs), block upconverters (BUCs) and low noise amplifiers (LNAs). Norsat’s vision for success remains the same now as 40 years ago — provide solutions for remote and challenging applications. No location on Earth is ever too remote or too challenging for communications. Norsat started the year with a $3.3 million order for the GLOBETrekker 2.0 portable satellite terminals. The order was received from a U.S. defense contractor who was supporting the U.S. Department of Defense and Intelligence (DISA) community. The GLOBETrekker, along with the ROVER and Journey Manpack, have been popular items for militaries around the world and generated much interest during 2017. Norsat continues to be a key supplier of satellite terminals and components to the military market. Norsat’s focus on R&D resulted in 2017’s launch of the ATOM 50 Watt Ka-band BUC and the industry’s first 4- and 5-band Ka- LNBs. The ATOM 50 Watt Ka-band BUC extends Norsat’s current Ka-band offering and is an addition to the ever-popular ATOM series. 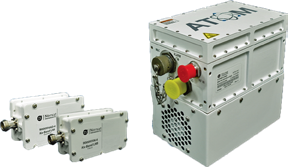 Norsat’s ATOM 50 Watt Ka-band BUC is up to 20 percent smaller and 50 percent more energy efficient than similar BUCs. The low-SWaP design on this product offers the lightest available weight on the market, being as much as 50 percent less than competing products. ATOM BUCs and SSPAs are excellent choices for portable VSAT and Communications-on-the-Move (COTM) applications (land, sea, air) where power efficiency, size, and weight are critical requirements. Complementary to the ATOM 50 Watt Ka-band BUC is Norsat’s new 4- and 5-band Ka- LNBs. Available in internal and external reference model families, these LNBs cover frequency bands from 17.2 GHz to 22.2 GHz. These 4- and 5-band LNBs (9000I4-4 and 9000I5-4 series) are the first of their kind in the industry and boast four or five frequency bands on a single LNB. Gain flatness is +/-2.5 dB, noise figure of 3.0 dB max, and input and output VSWR maximums of 1.5:1 and 2.2:1 respectively – all packaged in a lightweight and space-efficient form of 11.2 cubic inches of volume and weighing 550g. An upgraded multi-band LNB controller, which will drive both families of LNBs using 22KHz tone and output volume, completes the system to provide a comprehensive multi-band LNB solution. The launch of these products coincided with Satellite 2017 in Washington, D.C. The ATOM 50 Watt Ka-band BUC and the 4- and 5-band Ka LNBs were on display at this satellite show and became available to the mass market in March 2017. These products were also showcased at trade shows such as NAB, CommunicAsia, MILCOM, and more. Norsat has been actively involved in marketing the company’s products to the European and Asian markets with the addition of two new trade shows, China Satellite and DSEI. 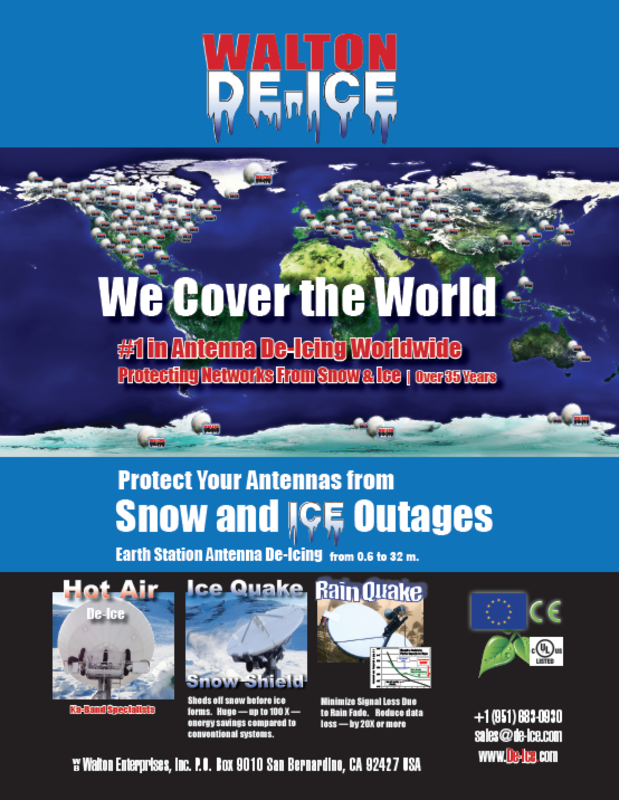 The products have been well-received by satellite operators, antenna manufacturers, research institutes, and satellite news/broadcasters. These markets provided great feedback about the new products, especially regarding size, weight, and performance. Two words easily sum up 2017 for Norsat — “eventful” and “busy.” With year-end orders stacking up, as well as planning for next year’s growth, the Norsat offices have been crowded as the company has expanded R&D, engineering, and production teams. More than 15 fifteen new jobs are currently open, as Norsat is looking for great engineers and other team members to continue the firm’s growth trajectory. Norsat’s ATOM 50W Ka-band BUC with 4- and 5-band LNBs. In the public sphere, Norsat was also active in the media. Norsat was listed on Branham300’s “Top 250 Canadian ICT Companies” list and Business in Vancouver’s, “Top 100 Tech Companies in BC” list. Through the company’s thought leadership program, Norsat has been covered extensively in the news and has been featured in more than seven different industry publications. 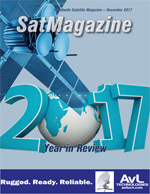 Examples of the Norsat-contributed published articles include, “SATCOM 2017 to 2020: Choosing for Change, A Norsat International Perspective” published in SatMagazine and “Determining Safe Distance from a Reflector Antenna” published in Microwaves & RF. In addition to the articles, thought leadership was showcased by Norsat through a number of presentations at conferences and trade shows. The most recent such offering was at China Satellite where Norsat spoke about the COTM market and technical considerations for LNBs and amplifiers in harsh environments. Norsat continues to show its thought leadership through these programs and will be actively sharing its knowledge throughout the industry. DO-160 airborne certifications for the firm’s RF products for multiple airborne platforms (manned and unmanned). Lastly, Norsat has also been receiving many customization requests from customers. The demand for customizations have been overwhelming and the market’s appetite continues to be strong for tailored products. As applications become more challenging, customers look for custom products to fit their unique technical requirements. Norsat is working hard to ensure that these custom demands are filled in the marketplace. The market for satellite communications equipment continues to develop at a quick rate and Norsat is growing with this demand. Norsat continues to expand the company’s customer base internationally, closing deals in Europe, Asia and South America. Norsat continues to invest heavily in R&D and staff engineers to meet projected and expected future product demands. 2018 will be a promising year for Norsat with many new projects already underway to meet expanding goals. With the company’s first successful space deployment in 2017, Roccor is focused on delivering cost-effective satellite products and peace of mind to a frenetic “new space” supply chain. Roccor was established in 2011 as an engineering services provider to satellite deployable systems houses. In 2016, Roccor acquired i2C Solutions, another engineering services provider with complimentary skills, and began in earnest the quest to become the industry’s leading supplier of low-cost, high-performance deployable structures and thermal control systems for satellites. A key to Roccor’s value proposition is the firm’s leading expertise in high-strain composite and multi-phase thermal management engineering and the dedication to rapid product evolution and qualification. The company achieves this using a collaborative build-test-learn-revise approach that closely engages customers and empowers the delivery of better product solutions. In 2017, Roccor delivered six deployable system flight units and gained the first successful space deployment of one of those systems. The remaining units are presently undergoing integration with their host spacecraft for launch in 2018. These flight systems were almost exclusively delivered to top tier Department of Defense (DoD) contractors for integration in “blue chip” DoD missions. In addition, 2017 witnessed Roccor perform key development activities on a major multi-year contract for the largest Solar Array Deployment System (SADS) procurement (volume-wise) in the history of commercial spaceflight. This program is for a privately funded commercial constellation provider and requires Roccor to deliver 20 systems before the end of 2017 that will be launched in May of 2018. Technically, Roccor’s key differentiator with the SADS, is the use of High Strain Composite (HSC) technology to drastically reduce part count and, hence, recurring cost and lead time reduction when compared to traditional approaches. In 2018, this SADS product will go into full production with a peak delivery cadence of 40 flight systems per month. Roccor will also deliver two solar sail/drag sail systems — one for a commercial customer and the other for a DoD customer — in 2018. Next year will be busy for launches with more than 25 deployment systems including antennas, solar arrays, and drag sails scheduled to be launched from sites in the U.S., India, and Kazakhstan. Also in 2018, Roccor plans to deliver the company’s first flat heat pipe and phase-change material thermal capacitor products for waste heat management on smallsatss. This burgeoning product line is aimed at addressing the thermal “choke point” that is developing as mega-constellation and “new space” mission architects endeavor to pack more and more power and electronics capability in smaller buses. Roccor is also engaged in a collaboration with University of Colorado, Boulder (CU Boulder), students that has successfully culminated in a deployment test of a Roccor boom aboard a sub-orbital launch of a NASA Terrier Improved Malemute sounding rocket. This rocket carried a payload package that successfully deployed a 2.6 meter boom in the harsh environment of space. This successful demonstration proved the maturity of Roccor’s high-strain composite boom technology and provided the company with invaluable knowledge of the kinematics of strain driven deployments. The launch occurred on Sunday, August 13, from NASA’s Wallop’s Flight Facility. CU Boulder undergraduate students participating in the RockSat-11 team, a project through the Colorado Space Grant Consortium (COSGC), worked closely with experts from Roccor who provided mentoring and guidance throughout the design process, in addition to providing two booms. The project, which took just over 10 months to complete, featured the RockSat-11 team’s 15 lb. payload in addition to seven other experiments from seven universities across the United States and Puerto Rico. Students monitored several environmental conditions of the boom, both before and during the flight, including temperature and humidity. The payload was also equipped with two low-resolution cameras, which captured still images of the boom, and two high-resolution cameras, which recorded video of Roccor’s boom deploying in space (and can be viewed at drive.google.com/file/d/0B7F1F85LZm7mUGZTOTFSUFVER3M/view). Through this partnership, Roccor helped COSGC to provide students with hands on educational experience and training that would not otherwise be available in the classroom. Roccor believes strongly in supporting educational outreach and mentorship for students, and currently employs two COSGC alumni. In addition to this suborbital hardware, Roccor has already delivered five spaceflight deployable systems for use on U.S. Government orbital programs. Being able to meet the demanding flight pace for such a diverse array of products and customers expected during 2018 is a tribute to Roccor’s strong partnerships with academia, local, state, and Federal governments, as well as top-tier aerospace contractors. This activity also demonstrates Roccor’s growing prominence in Colorado’s fast-growing space ecosystem. Ultimately, the successful entry into the frenetic “new space” supply chain for the company is a testimony to the dedication of the firm’s employee owners and the effect that the customer-centric culture has had on the ability to bring more value per dollar, per pound, of product shipped. For the Space Data Association, to say 2017 has been a busy year would be an understatement of enormous proportions; however, the work has also been highly rewarding, working toward improved operational safety of flight and a better space environment for all. This was also this year that the SDA announced the intention to launch the Space Data Center 2.0 (SDC 2.0), the next-generation SSA system, supported by technology partner Analytical Graphics Inc. There is definitely increased awareness from the majority of the industry that sharing the space environment and RF spectrum data is beneficial, both to individual companies and the space environment as a whole. This is made abundantly clear from the SDA’s already strong roster of members — 35 in total, which account for 273 geostationary satellites — that equates to approximately 62 percent of all active satellites. This year, the SDA committed to a number of new members. ExoAnalytic Solutions, Omnispace, Spire and Telebras joined the organization. Naturally, the more members the SDA can represent, the more effective the organization can be in ensuring safety of flight — the SDA is constantly looking for new members to join the group. This year, Eutelsat’s Mark Rawlins departed the SDA after completing an excellent job of running the group for the past two years. This has been quite a challenging time to take over, with a great deal of effort to bring SDC 2.0 to fruition. Not only was there a change of Chairman, the SDA also had a number of transitions among other Directors. Mark Rawlins handed Eutelsat’s Director representation to David Zamora; however, Mark stays connected to the SDA as an alternate Director. I effectively replaced the Inmarsat representative, John Mackey. Mark Daniels at Intelsat was replaced by his colleague, Jean-Luc Froeliger, and at Airbus, Phil Wadey stepped down and nominated Brian Swinburne to take his place. The SDA also said goodbye to Erika Rossetto, who has done a superb job of leading the Flight Dynamics activity, but is now doing an equally important job as a new mother. 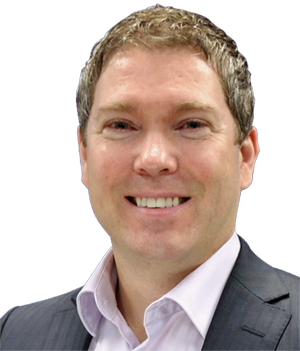 Guy Wilkinson from Avanti stepped in and represented the SDA at the IRG workshop in October. The organization is pleased to have these Directors move into their roles, especially when there is currently a great deal to achieve. Getting a new perspective on the organization’s work is also extremely valuable when delving into extensive and detailed developments. The SDA’s plans regarding SDC 2.0 were announced earlier this year. Together with Analytical Graphics Inc (AGI), the SDA announced an agreement to launch an updated Space Data Centre (SDC) to provide Space Traffic Management (STM) services, powered by AGI’s ComSpOC. With cyber-security at the platform’s heart and the legal protection offered by the SDA membership terms, the SDC 2.0 provides an environment wherein operators can share their data with the utmost confidence. 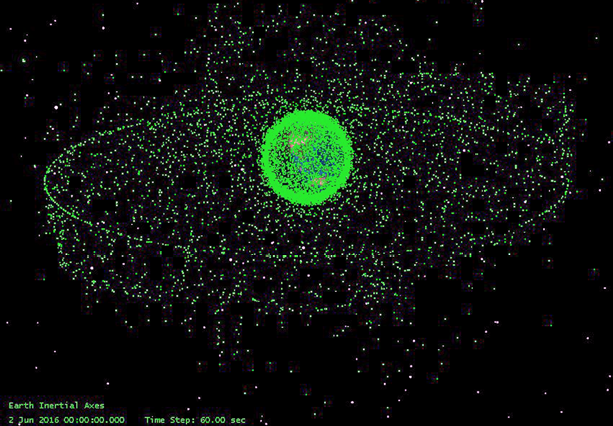 For those in the industry, it’s inherently obvious that the space environment has altered significantly, as the number of satellites being launched continues to multiply. Naturally, more satellites mean less space, and an even more crowded space environment leads to an increase in close approaches. The Space Data Centre has been successful in terms of bringing together operational information with the publicly available catalog information and the goal of bringing potential conjunctions to the attention of operators. However, inherent limitations with these sources of data and an ever more congested space environment has highlighted a need for more accurate, timely and highly reliable actionable operational information. This will allow operators to far more effectively protect their key assets, while also protecting the long term space environment. As part of the technical analysis, the SDA and AGI conducted extensive collision risk and encounter rate research, which draws upon a combination of data sources and methods. Sources included JSpOC data drawn from 34,000 GEO conjunctions closer than 10 kilometers within a three year period, conjunction data from the Space Data Center over that same three year period, and four additional independent analysis methods. These results, in aggregate, were then compared with the findings of 11 published external researcher papers. The comparisons revealed a clearer picture of collision risk, that being as much as four orders-of-magnitude greater than previously understood. Clearly, there is a distinct need to effectively mitigate that risk and that is exactly what SDC 2.0 aims to do. This will be in GEO initially — LEO operators will be supported at a later phase. As well as managing collision risks, the SDC 2.0 will also have the cutting edge capability to enable RFI events to be quickly mitigated. Through knowledge of the payloads on orbit, coupled with a carrier ID database, potential geolocation scenarios can then be rapidly determined and put into action. The SDC 2.0 will give actionable warnings with an accuracy that means the risk of collision can be drastically reduced. As with SDC 1.0, SDC 2.0 relies upon operators signing up for the platform, enabling the SDA to feed operator data in and keep the entire space environment far more protected. The more operators that join, the more the risk of collision — SDC 2.0 can assist in the reduction of space environment pollution. As well as meeting with individuals, the SDA also had a few opportunities to present SDC 2.0 at a number of industry conferences. This included SMI’s Military Space Situational Awareness, CNES CA workshop and the Satellite Interference Reduction Group (IRG) workshop, among others. The SDA also organized a briefing before the CNES CA workshop in Paris to present some of the technical details behind SDC 2.0 and the research that was undertaken to determine the best estimate of the probability of collision. With space becoming ever more congested, it is even more imperative that the organization be able to manage risks effectively. Therefore, the SDA’s focus in 2018 will be on getting as many operators on board as possible and to initiate the roll out of SDC 2.0. This will be an iterative process, with the development following a clear roadmap that will enable the capabilities within SDC 2.0 to be on a path of continual improvement with the goal of improving safety of flight for everyone. The SDA looks forward to receiving far fewer warnings as a result, but knowing when a notification is received, such can be acted upon with the knowledge that the advisory is based on the best data available and can be reliably mitigated.